National Protected Areas (NPAs) are still under threat from illegal logging and wildlife hunting despite stronger measures imposed by the authorities to curb illicit activities. A senior official from the Ministry of Agriculture and Forestry, Mr. Bualy Phameuang, told Vientiane Times on Monday that people were not only felling protected tree species but were clearing woodland for development projects without informing the authorities. “We are setting up NPA management divisions which will be based in 11 of the 24 National Protected Areas. These divisions will be operational in all NPAs by 2020,” Mr. Bualy said. Last year, authorities apprehended 100 unlawful loggers and confiscated logging equipment and other items used to hunt wildlife. Critics say that due to the high demand for timber, especially valuable prohibited species such as rosewood, traders continue to hire villagers to fell trees for them but they illegally take the wood in small quantities for sale at markets in many places. 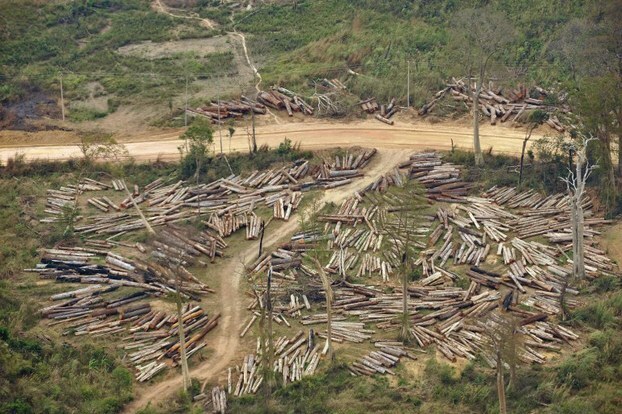 Director General of the Industry and Handicraft Department under the Ministry of Industry and Commerce, Mr. Manolack Rasachak, said recently that illegal logging was still taking place but had been declining in recent months following a Prime Ministerial Order in May 2016 banning the export of all types of unfinished wood products, including timber and logs. But it was important for all sectors involved to fully understand the order and strengthen their collaboration in order to implement it effectively. As of May 18, 2017, more than 59,160 cubic metres of illegally harvested wood weighing more than 113 tonnes had been seized, according to the Ministry of Industry and Commerce. The Ministry of Agriculture and Forestry is discussing how forests can be better protected by delegating more responsibility to provincial authorities and by enhancing the role of NPA management divisions. The ministry is committed to serious management of the timber industry and convincing villagers to help protect woodland areas. The government’s efforts should enable Laos to accomplish its goal of increasing forest cover to 70 percent of the country’s terrain by 2020, facilitating socio-economic development and poverty reduction efforts. Last year, Prime Minister Thongloun instructed the relevant authorities to inspect and reforest NPAs that had deteriorated over past decades. He recommended that reforestation be carried out with the participation of local communities, discouraging them from encroaching into woodland areas and enlisting their help in planting trees and protecting forests. The government has noted that forests are critical for hydropower and improving the livelihoods of local people.